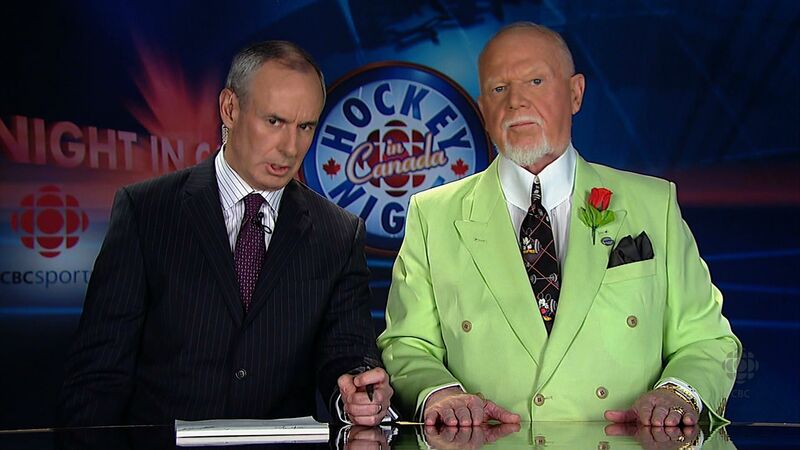 So the playoffs have begun, which means Don Cherry will be coming at us from whole new unexplored worlds of awful. And why not kick things off with a suit that is clearly the cousin of last year’s yellow and black checkered number? No, seriously, why not? 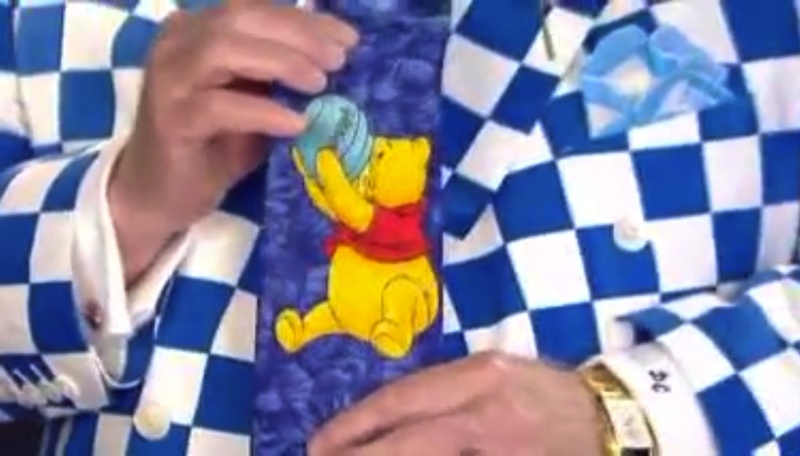 And while we’re at it, why not throw in a strangely incongruous Winnie-the-Pooh tie? So this is from Hockey Day in Canada last month. The day’s festivities were hosted from Whitehorse, Yukon, and they included a WHL game between the Vancouver Giants and the Kamloops Blazers, numerous other hockey- and skating-related activities, and of course, Don Cherry in the Coach’s Corner. 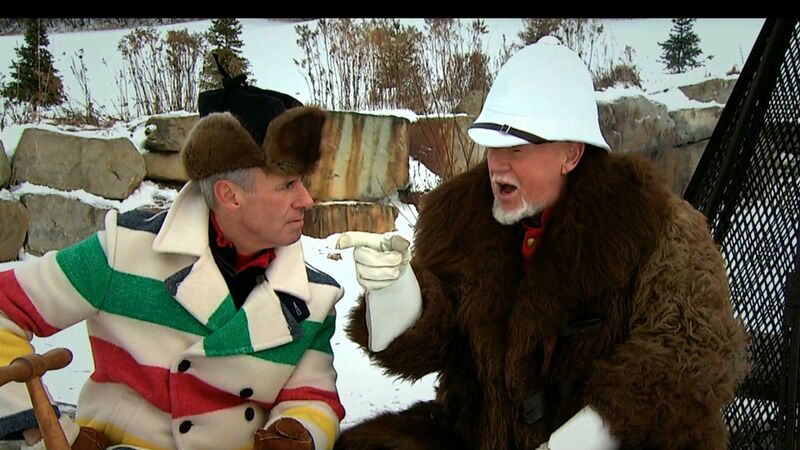 And it wouldn’t be a Don Cherry segment if it didn’t have some outrageous fashion, terrible character acting, and highly dubious relevance to anything. Seriously, the “plot” of these segments is so unimportant and unimpressive I don’t even remember what they were supposed to be talking about. I just take still shots from the television, folks. 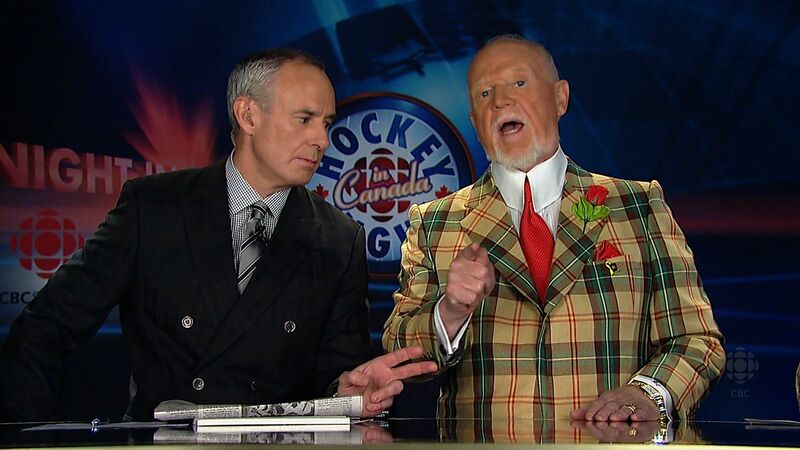 That’s all my brain can handle when it comes to Don Cherry. But neither Don nor Ron disappointed with their sartorial choices. Don was decked out in some kind of Old Man of the Mountain fur coat and white hat and gloves, which is strangely an improvement of sorts over his usual fare in that the questionable tailoring and loud patterns don’t distract from, or even contribute to, the overall impact. 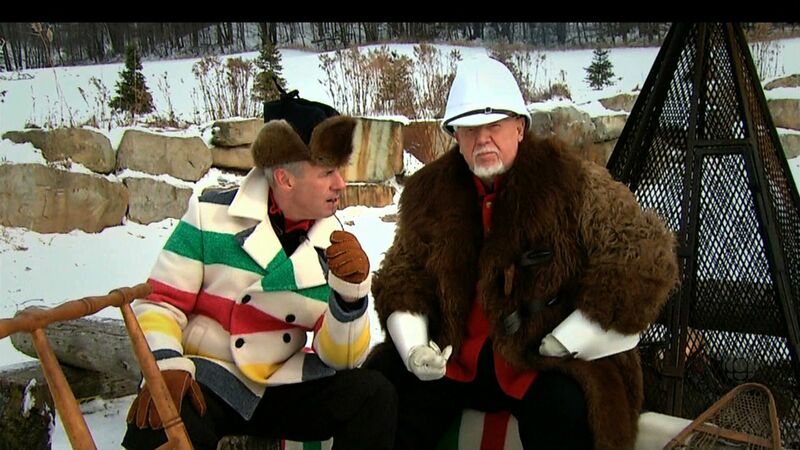 Unfortunately, the same cannot be said for Ron’s M&M-colour-striped coat and wildly mismatched fur hat. 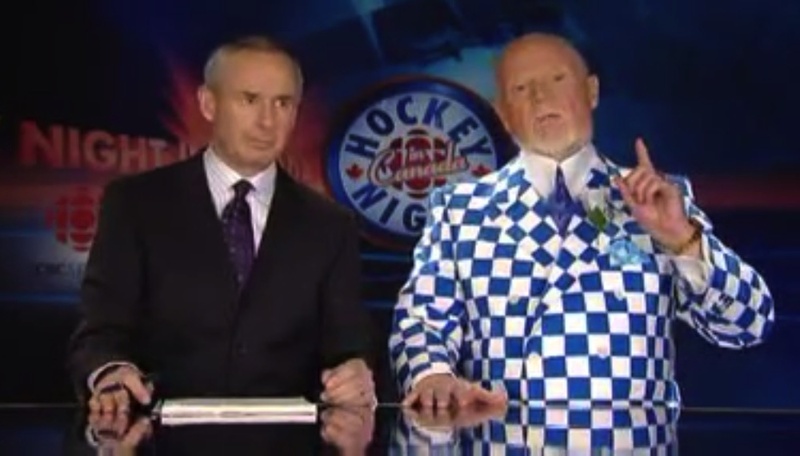 And of course, it wouldn’t be a Don Cherry segment without the requisite shouting and pointing. 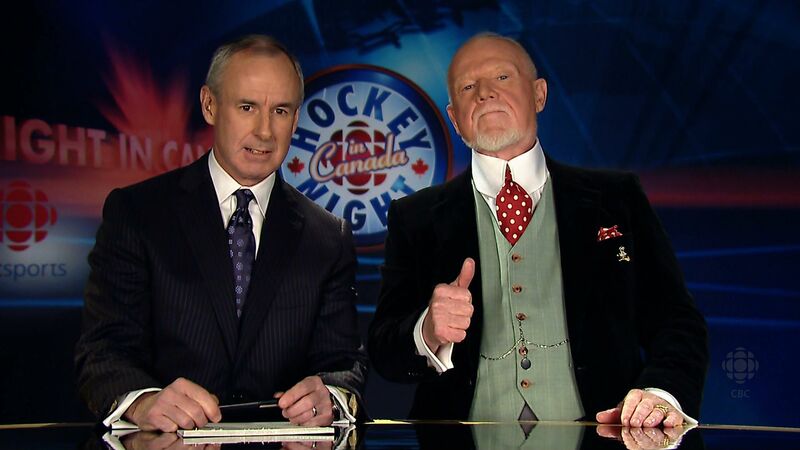 What class, Grapes. What refinement. 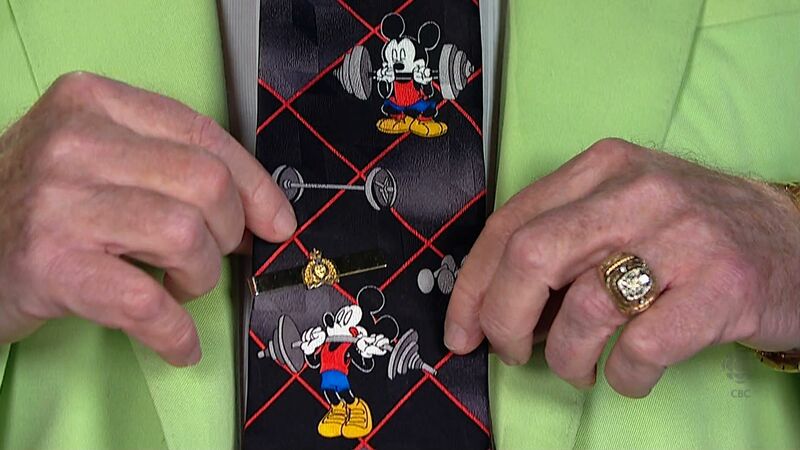 Also, a tie featuring a weightlifting Mickey Mouse. I just…?! 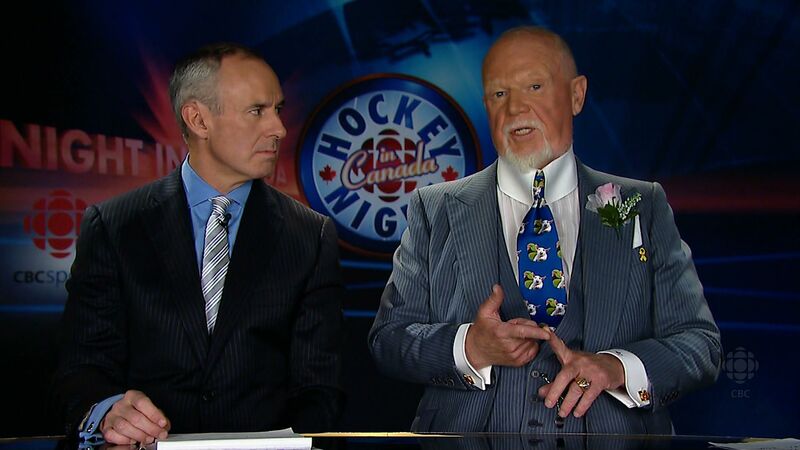 So I know Don likes plaid, and I know he likes wearing a flower on his lapel, but in this case, there’s such a horrible clash of colour that I am not sure what, if anything, could be done to salvage this suit. The shiny red tie with tiny black dots, along with the red flower and pocket kerchief, simply do not go with the tan plaid suit. Also, the cut of the front flap of the fabric, right along the white stripe in the plaid pattern, makes the construction of this jacket look cheap to my eye. Unless you’re going for the used-car salesman look or something, my advice is to stay away from broad stripes in shades of brown. 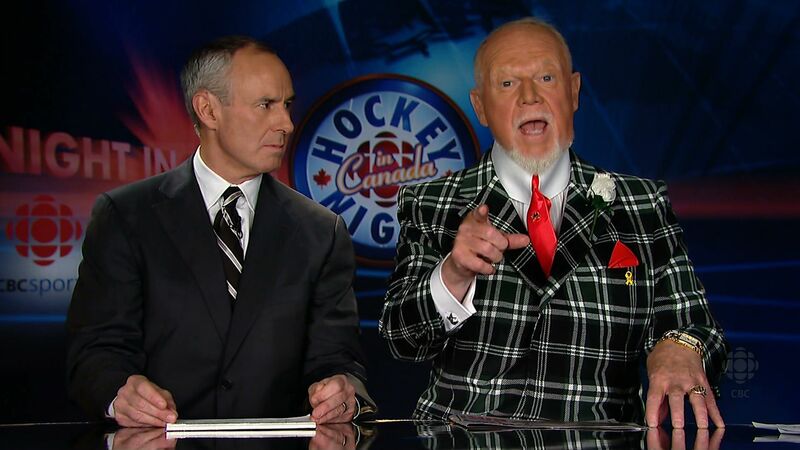 Tonight’s number from Don Cherry is tartan with black and dark forest green (see if you can spot it; it took me a few seconds). I don’t know if this is the properly registered tartan for Clan Cherry. Wouldn’t surprise me though. 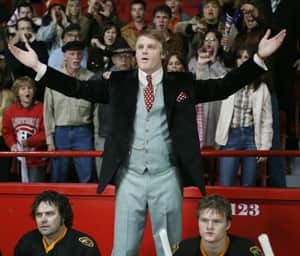 Don mentioned in the After Hours tonight that he’s had this particular three-piece suit since he was coaching in Boston, and praised its quality for having lasted him so long. I have no reason to doubt this, as it’s somewhat more sedate and less garish than most of the jackets it has been his wont to wear since. His tie, on the other hand, was his usual crazy—and this time has words. From a distance, it looked a bit like a pit bull with leaves, but on closer inspection is revealed to be a parrot. The writing on the tie says “Lil Burkie” (presumably referring to Leafs GM Brian Burke) and “Lil Blue” (which refers to the pit bull somehow? I guess? 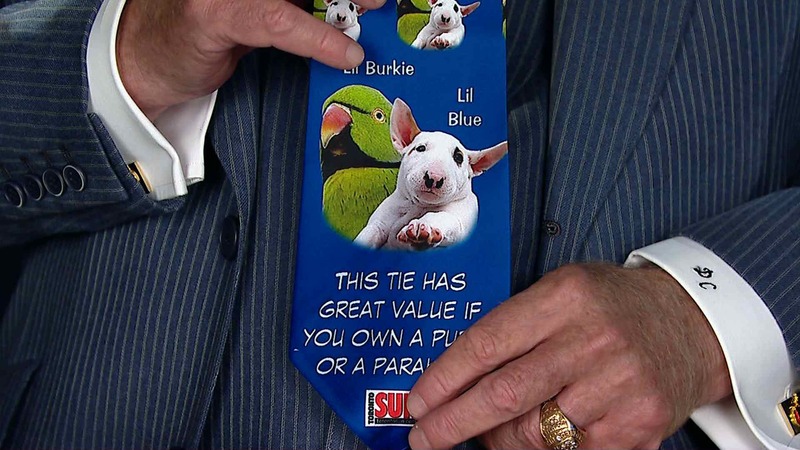 ), and the main sentence says “This tie has special value if you own a puppy or a parakeet” (which is odd, since the bird is a parrot, not a parakeet). Whatever. Some things mere mortals like me were plainly not meant to understand.